"A Notch Above the Rest"
The charts below list our cottages and basic amenities. 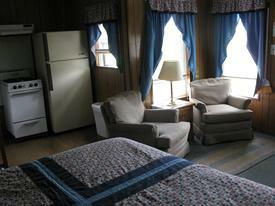 They also show the rates, with discounts, and occupancy limits. Which cottages are dog-friendly is listed below the charts. Go to our reservations page to check availability and reserve online. not to exceed maximum occupancy. at an additional fee of $5 per night. 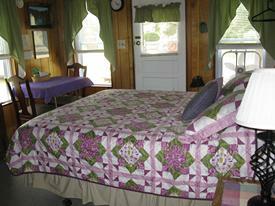 Cottages 2, 3, 4, 7, 9 & 14 are dog-friendly (under 20 lbs). Cottages 10, 11, 15 & 16 are also dog-friendly (under 40 lbs). Cottages 1, 5, 8, 12 & 13 are completely pet-free. Sorry, we do not allow cats at any time. NOTE: There is a 'pet-fee' (per cottage, not per night). The pictures below show 1 example of our 1, 2 or 3 room cottages. Click on each to see more pictures and detailed descriptions about each cottage. Each cottage has a refrigerator, microwave, coffee maker & toaster, whether it has a kitchen or not. Every cottage also has a BBQ grill, picnic table and grill utensils. (You supply the charcoal for the grill). Plates & utensils are not supplied in the cottages without kitchens.